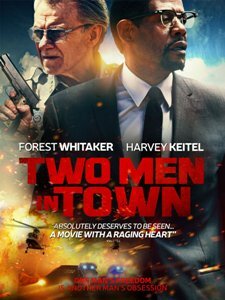 A loose remake of the 1973 José Giovanni film of the same name, Rachid Bouchareb’s Two Men in Town (2014) transplants the original’s critique of the French judicial system to New Mexico. Starring Forest Whitaker as a Muslim ex-con struggling to carve out an honest life, Bouchareb’s latest livens with the occasional moment of clarity but lacks the strength of conviction necessary to articulate its loaded message. After a brief exposition depicting the murder committed by Whitaker’s soon-to-be-released convict William Garnett, Bouchareb takes us on a helicopter ride to observes the expansive Mexican border. From the off, themes of escape, imprisonment and freedom emerge as the central pillars of Two Men in Town’s narrative – a clear swipe at a world governed through fear and corruption, whilst built around intangible ideologies such as freedom and liberty. The local sheriff Harvey (Keitel) appears empathetic to the illegal immigrants attempting to breach the border, yet has no sympathy for Garnett despite his exemplary prison record and recent conversion to Islam – believing that eighteen years in prison isn’t an appropriate sentence for a convicted cop-killer. Undermining Garnett at every move, Keitel’s lawman remains unconvinced a man can find redemption so simply. Garnett’s amiable parole office (played by Brenda Blethyn) tries her hardest to keep the peace, however the emergence of Garnett’s former crime boss exacerbates the situation – pushing this now reformed criminal to breaking point. Appropriating the western template in a manner similar to The Three Burials of Melquiades Estrada, Bouchareb’s latest is an archetypal tale of redemption that struggles to ever get going. A humid atmosphere of social disorientation fills the air, whilst a score of clichéd weeping guitars adds an extra layer of sobriety to this dry and arid borderland tale. Initially, Garnett seems an enigma for the audience to unravel, and there’s certainly some enjoyment to be gained from piecing together his life. We begin to question just how strong his resolve is and if he will fall back into criminality. Whitaker’s incisive demeanour is ultimately the film’s strongest asset – requiring very few words to express the depth and breadth of his character’s emotions. Just as the sun dictates Garnett’s prayer cycle, Bouchareb uses the sunset to illustrate his protagonist’s constant evolution. Sadly, it’s an all too literal cycle, acting as a hackneyed denunciation of the revolving door prison system. There are some commendable moments in Two Men in Town, namely the scenes shared by Whitaker and Blethyn’s firm, but sympathetic parole officer. Blethyn’s confident and brazen performance collides luminously with Whitaker’s calm yet troubled ex-con. Sadly, the same can’t be said for the rest of the cast. Keitel never really hits the mark, whilst Luis Guzman’s preposterous turn as a criminal kingpin instils as much fear and intimidation into proceedings as a clown at a children’s birthday party. Blethyn’s quickfire parole officer attempts to placate Keitel’s anxious sheriff by explaining, “without trust there can be no second chances”. Yet, by not trusting his audience to decipher the signposted meanings behind his contrived narrative, Bouchareb sacrifices all subtlety. Whilst his 2006 film Days of Glory paved the way for eventual justice, Two Men in Town is a banal and weak offering that adds little to the debate on the merits of the judicial system. This review was originally published as part of our coverage of the 2014 Berlin Film Festival.